How will you measure up with your customers? Torque about a great brand impression! Utility and convenience: perfect for your company. A great metaphor for your company that does it all. We live in the age of DIY, when even the most fumble-fingered numbskull thinks he can fix a broken washing machine if he just watches a video on YouTube. Of course, he can't even begin to tinker with that machine, ultimately destroying it, unless he has custom tools. And who are you to stand in the way of this aspiring Bob Vila, and his quest to completely ruin his own housewares (and his marriage, probably)? 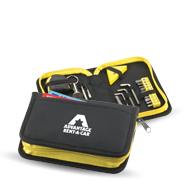 So for him, and for all of your customers and employees, it's time to get some custom printed promotional tool kits from Pinnacle Promotions. Put your logo or company name on custom tape measures and custom pocket screwdrivers, and your employees and customers will think of your business every time they ponder whether to mess with the electrical wires under their stovetops (oh boy) or pull the recessed lighting out the ceiling (please don't). Ideal for hardware or construction brands, custom tools are one of the most unique and efficient ways of getting your brand in front of your customers. And Pinnacle Promotions has all the custom tools you could possibly need. Get your logo custom printed onto a few of these custom tools, and start putting your brand to work. Promotional screwdrivers, hammers, pliers, and levels are essential for homeowner projects and for products that require assembly. Print your logo on the custom Quick-Release Tape Measure, or customize a bunch of custom Bic Lighters with Child Guard (guard for unskilled do-it-yourselfers not included). Or try the custom Pocket Pal 2.0 Screwbit Set, a great multi-function tool to have at home or in the office. A handy LED light helps your customer see just what he's breaking, and there's a clip so he can carry the set with him as he runs after his wife, who is now threatening to move out because the refrigerator is in pieces on the kitchen floor. The Leed's Workmate Pro 16-Function Promotional Multi-Tool includes pliers, three knife blades, three flathead screwdrivers, a Phillips head screwdriver, a bottle opener, a can opener, wire cutters, a dual-function file, a fish scaler (! ), and a ruler. It's a sophisticated and functional tool that makes a great gift item and even includes a one-piece gift box so you don't have to worry about packaging. Even as you worry that the DIY'er might blow up his house. So get in touch with Pinnacle Promotions, and we'll get you set up with custom tape measures, custom pocket screwdrivers, and custom printed promotional tool kits that will keep your brand front and center during every DIY project. First Aid kit not included (though Pinnacle sells those too).